Iodine can be used to test for starch. If your goal is a single, smooth, even color, you'll need to immersion dye with a lot of water, and a lot of stirring. An easy way to avoid stirring, and to work with large volumes of water without having to carry the water yourself, is to use an automatic washing machine. You'll need a long cycle, longer than is usually found on a washing machine, to give the dye plenty of time to react with the fabric. You should stay near the machine and reset it before it begins to drain at the end of a wash cycle. If you want to walk away from the machine, you should wear a timer (clipped to your clothing, or on a cord around your neck), to remind you to return before the end of the cycle; otherwise, you may find yourself wasting dye and auxiliary chemicals, letting them run down the drain before you are done with them. Some top-loading washing machines will agitate but not drain if the lid is left open, in which case this is a very easy way to avoid problems. Preferably NOT all-purpose. Some people claim that you can use all-purpose dyes in the washing machine. Unless your washing machine can heat water well above the usual temperature of the water heater (which is typically 120 to 140°F, or 49 to 60 °C), however, results will be less than optimal. All-purpose dye works best at the temperature of a simmer, 190-200°F, or 87-93°C; lower temperatures produce results that are duller in color and are not very wash-fast. Water that is hot enough for best results will often shrink garments, though, which can be a real problem with lined garments or garments that fit correctly before dyeing. Fiber reactive dye. For dyeing cellulose materials, such as cotton, linen, rayon, or hemp, fiber reactive dyes are the best. They are brighter and more wash-fast than all-purpose or direct dye, and they work even in cool water, 70 degrees F (21 C) or above, which has obvious advantages in not causing shrinkage and not requiring extra heating of the water. 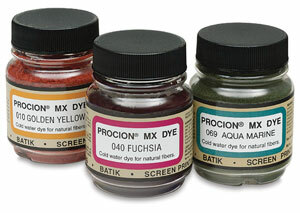 Good examples of fiber reactive dyes include Procion MX, Cibacron F, and Drimarene K.
Procion MX dye is readily obtained by mail order from most of the companies listed on my Sources for Dyeing Supplies page, while Cibacron F is available under the brand name of Sabracron F, from PRO Chemical & Dye. Drimarene K is the type of dye found in Dylon Machine Dye, commonly available in Europe but not the US; this dye is promoted as being formulated for use in front-loading washing machines. Drimarene K is also available from Batik Oetoro in Australia. Acid dyes. Acid dyes are needed to dye nylon, wool, and other animal fibers, such as mohair, angora, etc. (Silk is a special case and can be dyed like wool or like cotton.) Acid dyes will not dye cellulose materials such as cotton. Acid dyes normally require the same sort of heating as described above for all-purpose dye, but sometimes they are used in hot tap water. Top-loading washing machines are much easier to use for dyeing, because the lid can be opened at any time during the cycle, and dyes or auxiliaries can be added at will. Front-loading washing machines are much more frugal with water, however. Some front-loading washing machines, particularly in Europe, have heaters which allow fabric to be dyed or washed at temperatures much higher than tap water can reach. The best front-loaders for washing have dispensers through which dye and auxiliaries (such as salt and soda ash) can be added, taking care of the major problem of not being able to open the front door during a wash cycle. If your front-loading washing machine lacks these dispensers, try Dylon Machine Dye, if you can get it, as the instructions for its use do not require them. The ideal small dyeing studio should have both a top-loading washing machine, for use in dyeing, and a front-loading washing machine, for use in washing out dye. If you have a top-loading machine that still works, but wish to replace it with a front loader, consider keeping the top-loader, and stacking a new front-loader on top of your dryer, or underneath it. Prewash: All fabrics must be pre-washed before dyeing. Fabrics may have invisible stains that will affect the evenness of dyeing, or they may have finishes that will have the same effect. Use special detergent: For the very best and brightest results, it is best to use a special detergent for this purpose, because many commercial laundry detergents container optical brighteners which occupy the same positions you want the fabric to make available for the dye, and brighteners make deep colors look less intense. Appropriate detergents include Synthrapol, or pure SDS (sodium dodecyl sulfate or sodium lauryl sulfate), commonly sold in feed stores under the brand name Orvus. However, results of dyeing are generally acceptable even when ordinary detergents have been used for pre-washing. If you don't have Synthrapol, don't worry; just use whatever detergent you have. Beware of starch: Sometimes fabrics will have been treated with starch before sale. Starch presents a major problem for the dyer. It will take up dye readily itself, then gradually wash out, giving the mistaken appearance of dye bleeding. Starched fabric is not suitable for dyeing, because washing does not remove most of it. To determine whether your fabric contains starch, drop 2% tincture of iodine on it. Iodine turns an intense blue in the presence of starch. Permanent press and other resins. If the fabric has been treated with a no-iron finish, or with a stain resistant coating, or with any sort of water repellant, dye will not be able to reach the fabric evenly, resulting in pale, uneven dyeing. A permanent press finish can be removed with muriatic acid, but the chemical is too hazardous to be suitable for home or studio use. Also, some after-dyeing dye fixatives, which are invaluable for combatting the poor wash-fastness of direct dyes and all-purpose dyes, will afterwards prevent dye from reaching the fiber properly. This may present a problem in dyeing the many garments that have been commercially dyed with direct dye. Other potential problems. Occasionally, different parts of a garment will be made from more than one lot of fabric, which look the same before dyeing, but then look quite different after dyeing. There is nothing to be done about this except chalk it up to acceptable losses, or dye only blank garments that have been sold as "PFD" (Prepared For Dyeing"). But won't it ruin my washing machine? No. I know lots of people who routinely dye in the washing machine; their machines do not seem to wear out any more quickly than other washing machines subjected to the same workload, though it is theoretically possible that the high levels of salt would speed corrosion in rustable parts of the machine. Using the machine on a daily basis for dyeing may shorten its lifespan somewhat; occasional use does not appear to be significant. Will it ruin the clothes I wash in the machine, later on? After dyeing, be sure to wipe up any spots of dye that result from splashing, spots that have appeared above the water level. If you are using fiber reactive dyes, you should wash your newly dyed items, first in cold water, and then in water that is as hot as the fabric can tolerate, to remove excess dye. If you are using acid dye, you should wash the fabric only in cool temperatures, and then follow that by using hot water to wash a load of rags or something else that excess dye will not ruin, preferably with bleach. After this, all excess dye should be removed, leaving the machine clean and safe for the next load. I have never had a problem with washing clothes, after dyeing, perhaps due to following these rules. Will the dye stain my washing machine? Occasionally, some turquoise MX-G (reactive blue #140) will cause lasting stains on the white enamel interior of the washing machine. (Note that many mixed colors of MX fiber reactive dye include this dye in their formula.) Other colors do not seem to do this, though I don't know about acid dyes. The stains do no harm and will not damage clothes that are washed later. Washing a laundry load with plenty of bleach may help to remove the stains. When dyeing in the bathtub, I have found that dye stains are easily removed with a scouring powder such as Bon Ami, though a bleach-containing scouring powder may be even more effective. Dye stains appear to adhere to soap scum rather than to the enamel itself.